In the world of investing, a good performance track record is often a crucial measure used to judge your credibility as an investment service. That’s why we’re excited to celebrate three years since we first started managing our customers’ money. This key milestone in Wealthify’s journey means we can now proudly present the all-important three-year performance results, across each of our five investment styles for our original investment plans. We started managing customers’ money during arguably one of the most uncertain economic periods in recent UK history. Over this three year period, we’ve delivered positive performance for customers across all of our original investment styles, in the midst of issues like Brexit. This goes to show that focusing on the long-term and ignoring the noise is a sound investment strategy. Our dedicated investment team, armed with powerful quantitative and qualitative analytical tools, spend every day analysing the investment landscape, watching out for potential hazards and searching for opportunities to deliver the best possible returns for customers. Over the past three years we’ve been active in our investment decisions and have never shied away from going against the herd. We prefer to focus on our own processes and research to drive what we think are the best decisions to generate long-term returns. We’re naturally delighted with these results – and we hope you are too. Looking ahead, we’re optimistic for the state of the global economy in the near-term and will remain focused on the opportunities that the ever-changing markets will offer. Your investments can go down as well as up and you could get back less than you put in. Wealthify is the new way to invest your money. The comments and opinions expressed in this article are the author's own and should not be taken as financial advice from Wealthify. When is a good time to start investing? 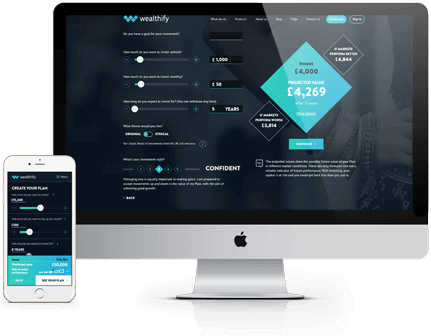 Wealthify have delivered excellent customer service for me when I needed some help transferring my general investment account to an ISA plan. I've also opened 2 Junior ISAs because I think its important to start investing for my children early. I really like the way their communications are really clear and informative. I've not had any problems as yet. I'm expecting my money to go down a bit as we are facing issues with uncertainty around Brexit etc... but investing is something I am hoping to do for a long time and I hope that this is something I will reap the benefits of especially for my children. The app and investment options seem good and all, but my reason for leaving a review was the amazing customer support I received. I spoke to Rhiannon Maggs and she was wonderful. The perfect person to talk to. She was kind, professional, helpful, and she replied instantly. I'm leaving this hoping that possibly someone in a managerial position may see this and be able to give her what she deserves. Honestly from my experience she is the perfect employee and should be rewarded. Thank you Wealthify, and thank you Rhiannon! My experience with Wealthify has been fantastic so far. The website is easy to use and the customer service are very responsive. Additionally, I had some issues with the app not working, so I emailed the team and they got back to me really promptly, not only fixing my issue by addressing the app issues and getting them fixed too! Great service. Quick responses from customer. Steady performance from the investment team. Easy to setup and use, simple charging structure, well balanced investment portfolios, easy withdrawal and lovely people.